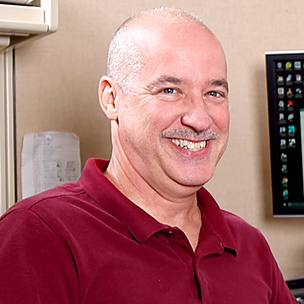 Crutchfield: What is a commercial audio system? By buying this product you'll earn up to 323 Rewards points. The Atlas AA50PHD provides power and signal distribution for background music and paging in a small- or medium-sized office or business. Four inputs — three unbalanced and one balanced with phantom power — let you play different sources of music and make announcements. Set the AA50PHD so the music mutes when the microphone is on or when its button activates the remote trigger. You can also route any combination of inputs to a Zone 2 output for a second set of speakers or for music on hold in a telephone system. Why do we say this mixer amplifier is smart? Well, because it has a PHD after its name, of course. We're talking about the Atlas AA50PHD, so that acronym stands for Push Here Diagnostic. Press the PHD button, and the unit will check to see if you've exceeded the recommended wattage for the amp or made an error in selecting impedance somewhere along the line. It's an amazing safety feature that can save you from damaging your equipment. See what our satisfied customers have to say. After we gather your information, we’ll send you a detailed system plan. It will include a link to a pre-filled shopping cart. Ordering is easy, and delivery is fast. This is paired up with several speakers in my office. Easy to use and pairs well with the atlas speakers. Researched by Crutchfield's Russ B.
Overview: The Atlas Sound AA50PHD is a four-input, 50-watt mixer-amplifier that is ideal for small to medium-sized retail, industrial, and commercial businesses that use background music, distributed paging, and music-on-hold. It can also be used for speech privacy systems. The amp can accommodate a variety of input sources, and can power a 4Ω speaker load, or 25V and 70.7V commercial speaker systems. 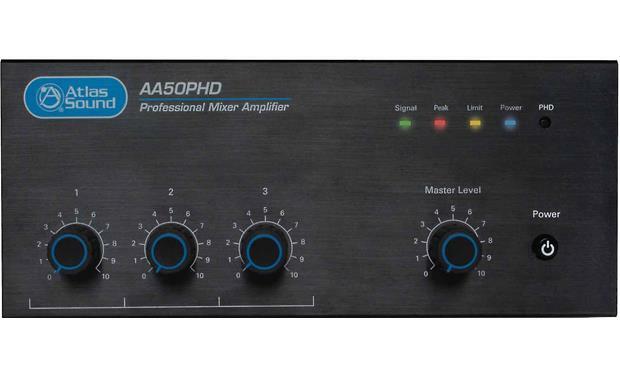 Push Here Diagnostic: This AAPHD series mixer amp includes a patent pending automatic system test to check the connected speaker lines for wiring and impedance errors. The front panel Push Here Diagnostic (PHD) button automatically verifies that the attached speakers' tap settings do not exceed the amplifier's rated power, that no speakers are mistakenly tapped at 8Ω, and the speaker wire is not shorted anywhere. The Channel 1 input has a removable Phoenix (Euro Block) connector with +, -, and G terminals for balanced microphone or line level signals. DIP switches on the rear panel let you select mic or line input, and turn on Phantom power for condenser-type microphones. The 2-pin Remote Mute terminals let you connect the contact closure wires from a mic switch to activate the Mute circuit. A VOX Mute Sensitivity Control, located beside Input 1, can adjust the sensitivity of the mute circuitry. This can be used to mute background music on another input channel when a paging announcement is made on Input 1. The Channel 2 and Channel 3 inputs are stereo RCA summing inputs for connecting a CD or DVD player. The Channel 4 input is a 3.5mm stereo summing input that can be used to connect an MP3 player or iPod. The input level adjustment for this input must be done at the source device. There is no input level control on the amplifier. Speaker Output: The amplifier has a removable Phoenix connector for the speaker outputs. There are connections for a 4Ω direct-coupled speaker load, or 25V and 70V transformer-coupled speaker systems. The Phoenix connector will accept up to 12-gauge wire. Zone 2 Output: The AA50PHD features a Zone 2 output that gets its signal from a selected input for music or messaging on hold applications. The Zone 2 terminal is an unbalanced 600Ω output with a maximum level of 1.0VRMS. A dedicated Zone 2 volume control is provided on the rear panel. The removable 2-conductor Phoenix connector accepts up to 18-gauge wire. DIP switches are provided for selecting an input source for Zone 2 from any of the inputs. Pre Out Jack: The Pre Out (RCA) connector allows you to feed a signal to another power amplifier or external audio device. An effects loop can be created by connecting the Pre Out jack to an equalizer or other device, and then back out to the Amp In connector. Amp Input: The Amp In connector can be used to convert the AA50PHD into a slave amp. 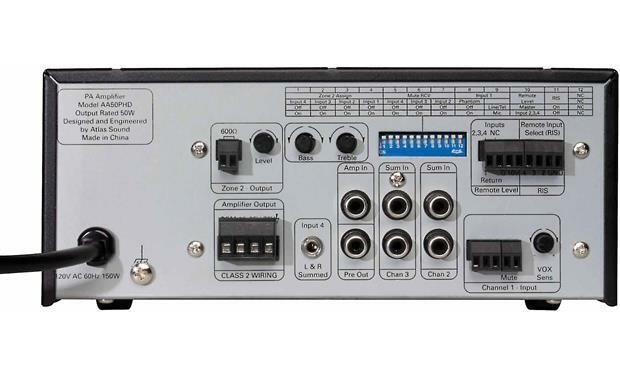 When a line level signal is connected to this input, the internal connection between the preamp and internal power amp is broken. The AA50PHD becomes just a power amplifier, amplifying audio signal applied to the Amp In (Pwr In) connector. Front Panel Controls: The front panel includes a master power switch (push button), a Master Level control, and rotary volume controls for Inputs 1 through 3. (There is no front panel volume control for Input 4.) The PHD switch is a flush-mounted button that requires a small tool with a point to activate the self-diagnostic test (See Push Here Diagnostic section above). There are status LEDs for Signal, Peak, Limit, and Power. Bass/Treble Controls: Separate rotary bass and treble controls are provided on the back panel. Normally set at the 12:00 position, the bass control lets you adjust bass frequencies from -6 dB to + 6dB at 100 Hz, while the treble control adjusts treble frequencies from -6 dB to +6 dB at 10 kHz. Remote Level Control: The Remote Level Control port lets you connect an optional Atlas Sound WPD-RISRL or WPD-VC10K level control. You can control the level of Input 1 or Inputs 2, 3, and 4 together. When a remote level control is connected, the system's maximum levels should be set using the front panel level controls, and use the remote potentiometer as an attenuator from the maximum levels set. Remote Input Select (RIS): With the optional WPD-RISRL wall-mounted remote input selector and volume control, you can select inputs 2, 3, or 4, and adjust the volume. This is accomplished without having to run an audio signal from the amplifier to the selector, which prevents picking up interference. The WPD-RISRL connects to the amplifier through the RIS and Remote Level connections on the amp, with a maximum range of 200 feet. DIP Switches: The versatile AA50PHD has a series of 12 DIP switches on the rear panel. The DIP switches can assign the input to Zone 2, turn on Mute Receive circuit for Inputs 2, 3, and 4, select the type of input (mic or line) for Input 1 and turn on Phantom Power for a Condenser Mic, assign the Remote Level Port to control Input 2, 3, 4 or Master Level, and turn on Remote Input Select. Dimensions: Width: 8.27", Height: 3.66", Depth: 10.87"
Searches related to the Atlas AA50PHD 4-input commercial mixer/amplifier - 50W x 1 at 70V.